The multi-day American Theatre Critics Association annual conference feeds my arts gluttony in several ways — many theatrical presentations of course (and these are to be covered in a separate blog post), conversations with critics and theatre professionals from around the country, and individual and panel presentations. The individual speeches and panel discussions on Friday June 15th and a delightful one-on-one conversation on Saturday June 16th will fill this set of musings. Such riches. ATCA awards a number of prizes in collaboration with several foundations, to honor playwrights or others who write about theatre. During this year’s conference we are joined by several playwright winners, and another winner is announced. In a beautiful meeting room at the Chicago Shakespeare Theater‘s lovely building at the end of Navy Pier, with an outdoor balcony space overlooking the harbor and Lake Michigan, we award the work of several contemporary writers and are honored to hear from them. (L-R) Chris Rawson, Darren M. Canady, Bill Hirschman, at Chicago Shakes, June 15, 2012. The 2012 Osborn Award comes with this plaque and a cash award. Image by Martha Wade Steketee. Darren M. Canady receives the 2012 M. Elizabeth Osborn New Play Award as an emerging playwright, for his play Brothers of the Dust. Canady, an assistant professor at the University of Kansas and native Kansan, frequently writes about the African-American Midwestern experience. This award has a lovely local feel, as Brothers of the Dust, the press release tells me, had its premiere in May 2011 at Chicago’s Congo Square Theatre Company. This award is intended to recognize writers not yet (but soon to achieve, we all expect!) national stature. The award was founded in 1993 and has been honoring writers annually since 1994. Caridad Svitch delivers at Chicago Shakes, June 15, 2012. Image by Martha Wade Steketee. 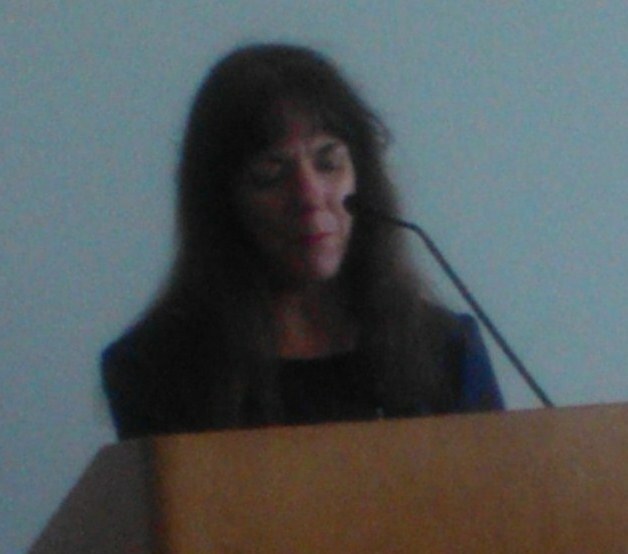 Caridad Svitch speaks to us and sings to us of the wonders and sometimes puzzlement of being a woman playwright. New Yorker Svitch won the 2011 Francesca Primus Award for her play The House of the Spirits and traveled to Chicago in 2012 to be honored this year. The 2012 recipient of the prize, Tammy Ryan for her play Lost Boy Found in Whole Foods, will receive her financial award immediately and will be celebrated in person at a future ATCA conference. My new membership in an organization that actively seeks out and monetarily awards new work by American playwrights continues to thrill my dramaturg’s soul. Terry Teachout in triplicate at Chicago Shakes, June 15, 2012. 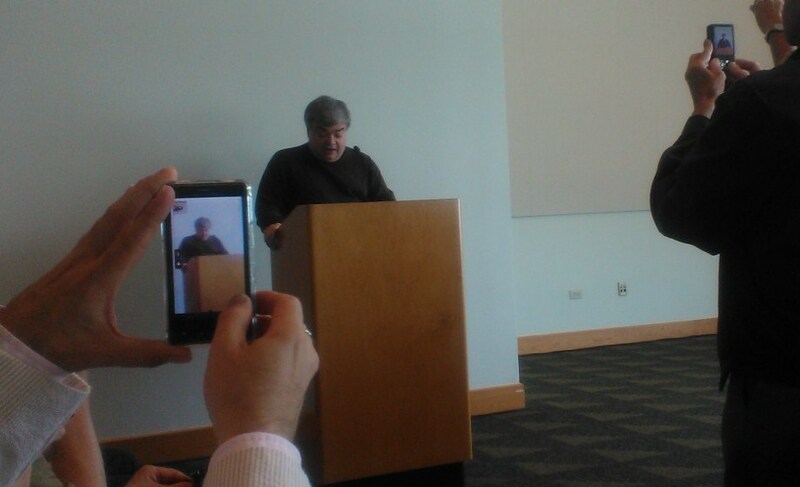 Critics as cell phone camera paparazzi cause me to chuckle more than once during the conference. Image by Martha Wade Steketee. Conversations and presentations also mark the conference. Friday’s agenda moves from playwright musings to the musings of a national critic who is also (we learn) a musician and a playwright himself. Since 1992 ATCA has held what it terms an “occasional series” of talks entitled “Perspectives on Criticism.” Today’s talk by Terry Teachout, Wall Street Journal theatre critic, provides self-effacing humor and tales of being a national and New York focused correspondent on the arts. He estimates that he reviews 100 shows a year, and now 50 of those are outside of New York City. His main message: “Don’t be afraid to be enthusiastic” and that the job of the critic is to “ring the bell for excellence.” He notes toward the end of his talk: “It’s not our job to be boosters …. It is our job to bang the drum when the drum needs to be banged.” Be a reporter (how is the audience responding, what’s going on around you), and be true and clear and strong in your stated opinions. Amen. 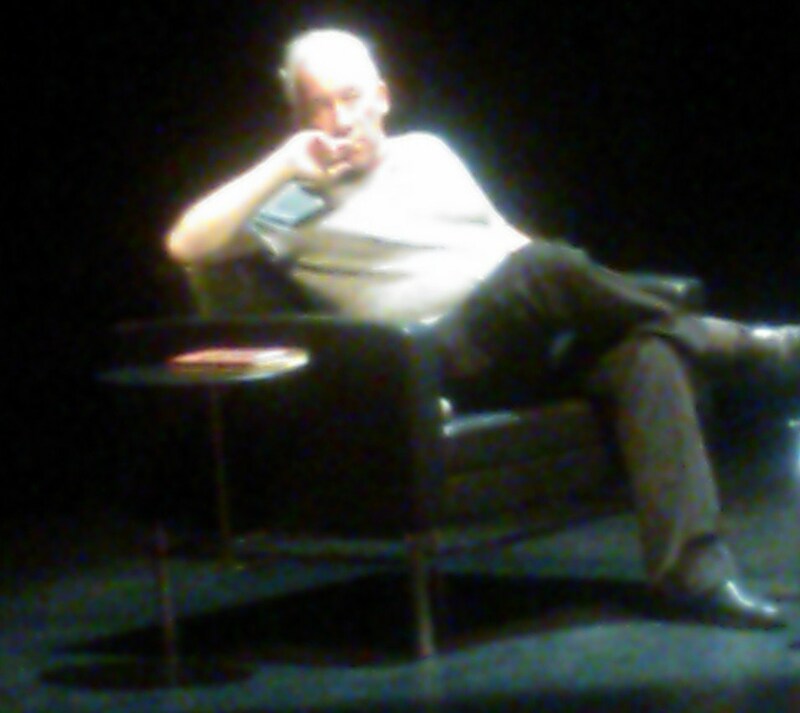 Simon Callow in repose at the Museum of Contemporary Art Stage, June 16, 2012. Image by Martha Wade Steketee. 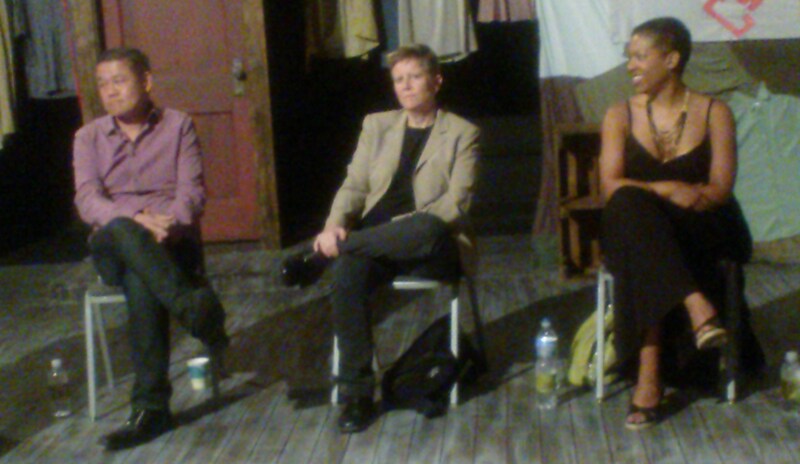 (L-R) Chay Yew, Bonnie Metzger, Lili-Anne Brown at Theater Wit June 15, 2012. Image by Martha Wade Steketee. The first panel of theatre professions from which we hear on June 15 addresses the question of “Diversity at the Top” from their perspectives as Artistic Directors of Chicago theatres — Chay Yew at Victory Gardens, Bonnie Metzger at About Face, and Lili-Anne Brown at Bailiwick Chicago. They all have layered careers — Metzger has been an academic and teaches play writing, Yew is a playwright, Brown is an actress who has very recently assumed the AD position at her theatre. For a range of reasons they find themselves at the heads of newer or transitioning theatrical organizations. Their comments are full of wisdom and inspiration. 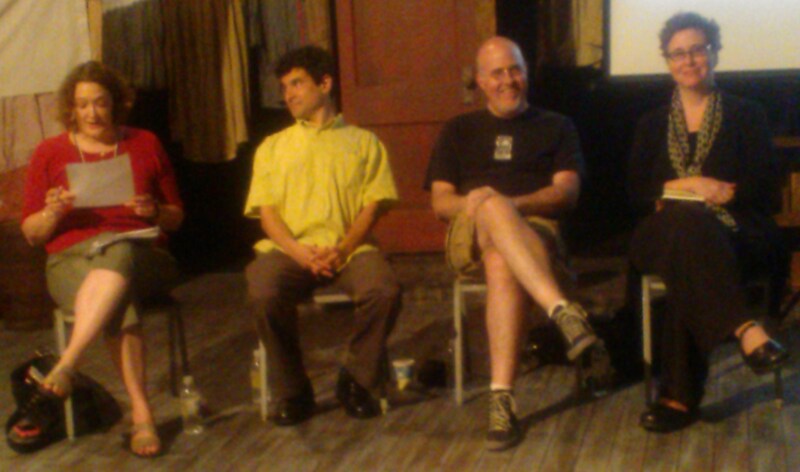 (L-R) Kerry Reid (moderator), David Isaacson, Greg Allen, Jenny Magnus at Theater Wit June 15, 2012. I love how Greg and Jenny appear quite aware their picture is being snapped. Image by Martha Wade Steketee. The second panel in Friday’s intellectually packed afternoon addresses theatre-making that pushes boundaries. Moderated by ATCA member Kerry Reid, David Isaacson of Theater Oobleck, Greg Allen of the Neo-Futurists, and Jenny Magnus of Curious Theatre Branch address, often laughingly, the topic of “The Permanent Avant-Garde.” All panelists reject the word advant-garde and any single jingo-istic word to describe their forms of theatre making. We are sent from these two panels out into Theatre Wit’s neighborhood for food, libation, and to prepare ourselves for various theatrical options for the evening. Inspired, energized, enthralled. One last image, with fuzzy cell phone focus with internal light. From our final business meeting of the conference on Sunday June 17, 2012. Our leaders. 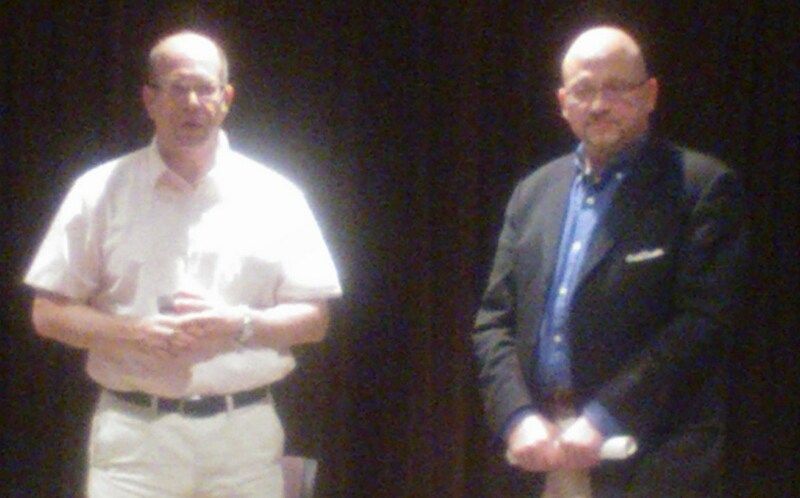 (L-R) Jay Handelman ATCA Chair, Jeffrey Eric Jenkins ATCA Foundation Chair at Silk Road Rising, June 17, 2012. Image by Martha Wade Steketee. Quite a rich wrap up and wonderfully presented. It’s nice to relive the moments all over again. Here’s hoping you’ll be relaying your experience of a visit to the Michael Feinstein Great American Songbook Initiative Archive and Museum in the not too far off future. Oh, Michelle, we can only hope. I can just see us chortling in the corner, beside ourselves over some delightful rare and wonderful tidbits in the Feinstein Archive … yes!